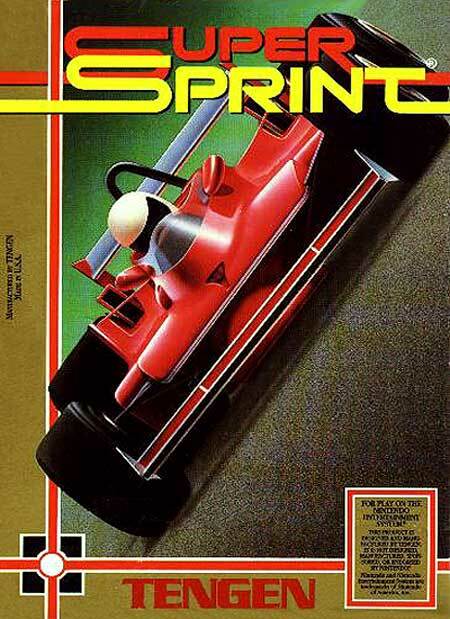 Super Sprint is a simple racing game. Up to three players drive simultaneously on a circuit against opponents controlled by the computer. The circuits are viewed from above and always fit on the screen, so the game never scrolls. After three rounds the winner advances to the next circuit. There are 8 circuits in total, but the game never ends - the circuits just repeat. As the player goes to higher levels, more and more obstacles appear on the track, like oil puddles and tiny moving tornadoes. If the car touches them, the player loses control over the car for a short time while it is sliding and spinning. Driving into a wall with high speed or falling from one of the bridges destroys the car, but a helicopter will appear to replace it. The car can be customized by collecting wrenches that lie on the track. The player can exchange three of them for improved traction, better acceleration or higher top speed.